Yes, Thor's Going to Be a Woman. And That's Okay. The news came earlier this week on The View that we'd be getting a new Thor. What's more, this Thor wasn't going to be the Chris Hemsworth type guy with rock hard abs and strong jaw that we've come to expect, but the woman we see above. Yes. Thor: God of Thunder will run its final issue this September after an enjoyable twenty-five issue run and give way to a new series simply entitled Thor. And I, for one, am more excited about this than I have been for a new comic release since God of Thunder was announced. This is undoubtedly a good thing, and I'll tell you why. First, nuts and bolts. Jason Aaron has been writing for Thor since the debut of God of Thunder in 2012, and he'll be continuing on writing this new book. In every way this seems to be a continuation of exactly what we've been getting for the past two years, which has been a high quality, relatively self-contained, and introspective comic. We can expect more of that. But before we leave the old thunder god behind us, we should think about what Aaron's project with Thor has been and what else might be left to explore. Thor: God of Thunder has been a comic about what it takes to be a god. What is it that gods do? How is it that Thor is worthy of being called a god? It's not merely by fighting cosmic threats and keeping baddies like Malekith at bay, that's for certain. That's just part of what Thor does, not all of it. Aaron's biggest contribution to Thor has been to show Thor answering prayers, minding the people he is god to, doing good because it is right, and maturing as a god. I talked to Aaron in 2012 and he told me that this was the thing he most wanted to explore, the question of prayer and what makes a god a god. It's not just power; Thor's godhood is tied more to his benevolence, his answering of prayers than it is to his strength. That, I think, is where worthiness comes from. And Aaron has played hard with that. God of Thunder features three Thors. There's the Thor of the Viking age, a brash and arrogant young god who is not worthy of Mjolnir because he has not learned, among many other things, humility. Then there's the Thor of today, the Avenger who wields Mjolnir proudly and has begun to take his godly duties seriously. In the most recent arc he's been helping S.H.I.E.L.D. environmental agent Roz Solomon fight against, well, Dario Agger, a Captain Planet type villain whose aim is to wreck the Earth while profiting twice - from both the wrecking and the band-aid efforts to stop the wrecking. Context for the above image: Agger had just announced the beginning of ice mining operations on Titan to solve Earth's shortage of potable water (caused in part by his own actions). Thor kind of completely obviated that. Aaron's biggest success in God of Thunder has been giving us interesting takes on Thor: A Thor who knows he will be worthy someday but doesn't understand how, a Thor who is worthy and tries his hardest but still has the hotheadedness to screw up big, and a Thor who manages to still be worthy despite being a bitter, grumpy old man, trying to resurrect a planet whose death he couldn't prevent. This has been the strength of the comic and Aaron's run as writer. All signs point to him carrying that through into the new series, and God of Thunder as something of a staging ground for Thor. There we'll get a new take, one that breaks farther from the established Thor and hopefully allows for better insight into what it is to be the god of thunder. So, we're going to get a new Thor. We have to wait until October - in the mean time we've got the Original Sin: Thor and Loki: The Tenth Realm (that title needs a colonoscopy) and God of Thunder #25 to look forward to. In the former we have Thor and Loki heading to the mysterious Tenth Realm to seek out Thor's long-lost sister. Some time between now and September, Thor's going to lose his worthiness. Seems to me it won't be one event, but the cumulative effect of things. In God of Thunder #24 Thor has left Broxton, Oklahoma in ruins in the course of attempting to save it. In The Tenth Realm #1 he and Loki find their way into the Tenth realm, opening the rest of the universe to danger. And this is after Thor leaves his comrades in the lurch to confront his All-Mother about the vision he had of his sister. He's elected to stay behind on Earth and not be part of Asgard - perhaps to some degree this makes him less worthy because he only tends to the people of Earth and not all who need him. We can't say for certain. The only thing we do know is he'll be unworthy by September. We're going to see some major changes there, but in the mean time we'll be getting a new hammer-bearer. And she looks awesome. I might quibble about the way her chest plate is shaped, but that's really it. 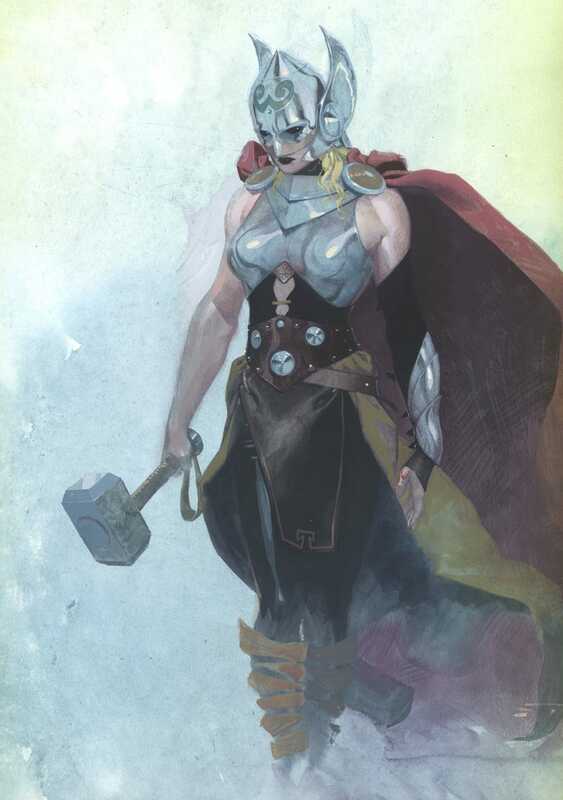 The big thing is this is going to be a different person, a different Thor with a new personality and new values worth exploring in the larger context of godhood. Yes, we've had Thors with different personalities for the past two years, but they've all been the same person. Their personalities are based upon the others: Thor the Avenger is still recognizably the Thor who fought among his Viking worshipers in the ninth century, and Old King Thor is still recognizably the Avenger and the old Viking god. The fun and the interest didn't lay in the similarities, though, but the difference. And that's exactly what Aaron's project has been building toward all along - a truly different Thor. What better way to make a big change to the perspective behind that new personality than to change one of the things we most fundamentally associate with the role and character of Thor? We're not losing the old Thor, so the new Thor needs to be visually distinct from him - more distinct than a changing the old Thor's weapon and giving him a Destroyer-arm makes him, anyway. And this gets to the heart of what's been the buzz so far - audience reaction. And the audience reaction has included a great deal of sexism. When it comes right down to it, the decision was only ever going to involve a Thor of either a different race or different gender. Some people really seem to hate the idea. But the fact of the matter is that making the new Thor a white woman is the safest, most conservative option for bringing in a completely new perspective into the role and making a big, big change. Imagine for a moment what would have happened if they'd chosen a black Thor - oh, wait, we saw how people reacted to Idris Elba as Heimdall. Can you imagine the "jokes" if we'd gotten a Latino Thor? How much worse would it be if we'd gotten a Thor who was both a woman and non-white? I'd have loved to see something more daring, but I'll take this for what it is: trying. Trying's good. You don't get anywhere without trying to get anywhere first. But Thor is and remains a man, and a God from a true religion. Changing his gender is an insult to this religion and its practicants (which I am). I don't want people to think about a woman when I explain that the tattoo on my wrist is Thor's hammer, because it was never a woman. Period. Yep, nerds a raging because their representation of Asgardians isn't faithful to old myths, despite the fact that nothing about the Asgardians in the comics really resembles the old myths anyway, from Thor having blond hair to Asgardians being basically aliens. Those objecting on the grounds that Thor is a name and not a title, well, again, Marvel does what Marvel wants. Thor Odinson was Thor Odinson, God of Thunder. Now he's just Thor Odinson. And besides, you know what Thor means? It means God of Thunder - Þórr comes from Þunraz, the proto-Germanic name for the God of Thunder and also just the word for thunder. If you're going to be a pedant, I'll be a bigger one right back and point out that if you're taking the role of thunder god/goddess among the Asgardians, the only name that's appropriate for you is Thor - because that is both name and title, and there's no getting around that. The new Thor's going to give us some good opportunities to explore what it means to be Thor, the God of Thunder, in new ways. Thor Odinson will be off doing his thing, getting some welcome development in other books, and the new Thor will be here to keep us satisfied with the adventures of Mjolnir and its amazing wielder. When Thor Odinson returns to worthiness, which I'd peg at somewhere around two years from now, we can probably expect him to be a bit more like Old King Thor. As for our new Thor, she'll probably find herself doing something new rather than disappearing - Odinson gets a breather and time to change as a character so he doesn't get stale, and in the mean time we get a new character (or perhaps she's an old one stepping up - it's not certain who she'll have been beforehand) and we'll get a chance to explore what it means to be a newly-minted god, something Aaron couldn't really explore with any of his three Thors in God of Thunder. The decision ultimately stems from the impulse which brought Aaron to want to write Thor in the first place - to explore the concept of godhood. It's an impulse which has given us some good stories so far, and I'm highly inclined to keep following to see where that impulse takes us and Thor. Now if only we could get some of this mojo from the comics to rub off on the cinematic universe.